With the 3rd largest proportion of Chinese residents, Manchester has become a hub for Chinese New Year in Britain and the airport is no different. Whether you’re heading out to Beijing, Hong Kong or anywhere else in the world, we’d like to invite you to join in our Chinese New Year celebrations throughout January and February. There’s plenty going on in the airport so to help you join in, here are our top 5 ways to celebrate the year of the boar in the airport. 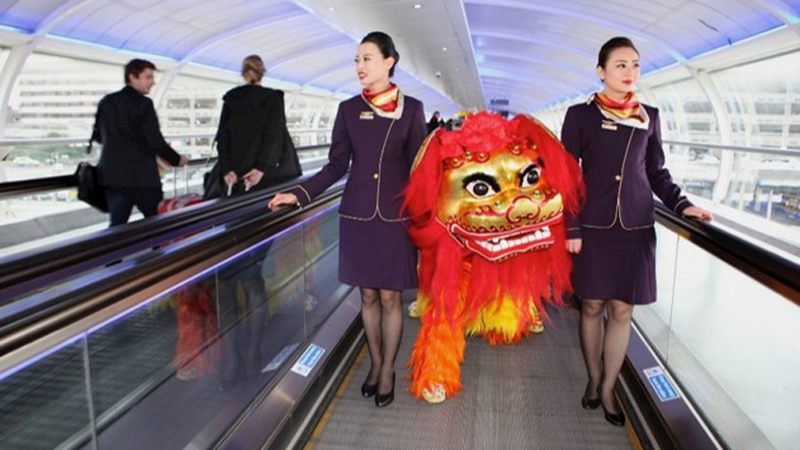 Enjoy a traditional Lion Dance to ward off evil spirits while you’re waiting for your flight. As the Lion dances throughout the terminal, there will be free Chinese snacks and even a pig, for the year of the boar, handing out lucky envelopes. To celebrate the New Year, the Manchester Airport Choir will be performing Gong Xi and other traditional Chinese pieces welcoming the year of the boar. Symbolising new growth, transformation and prosperity, a traditional wishing tree will be set up in the departure lounge of Terminal 2. Please take the time to write your New Year’s wish and enjoy the good fortune it brings. While you’re getting caught up in New Year’s fever, take the time to snap a few pics and tag the airport for a chance to win exclusive Chinese New Year goodies. Terminal 2 arrival hall will be hosting an exhibition in collaboration with CFCCA focused on the growing Chinese internet culture known as the ‘Chinternet’. Here you can find a range of incredible, exclusive artwork from leading Chinese artists. On behalf of Manchester Airport, we’d like to wish you an incredible New Year filled with good fortune and if you are planning on heading into Manchester during the festivities you can find plenty to do by clicking here.